LANEIGE 2 Tones Up!” (Application – Phase 1) is a sampling campaign. The Campaign will run from 9th March 2015 to 22nd March 2015 OR until the 3500 sampling kits are fully redeemed – whichever comes first. Complete the submission by filling in a short registration form whereby they will need to specify which country they are located in and provide their Full Name, NRIC, Email Address, Mobile Number, Registered Address, Preferred Outlet and Agree to the Terms and Conditions of the Campaign. LANEIGE 2 Tones Up! are to be redeemed at the selected LANEIGE counters in Malaysia. 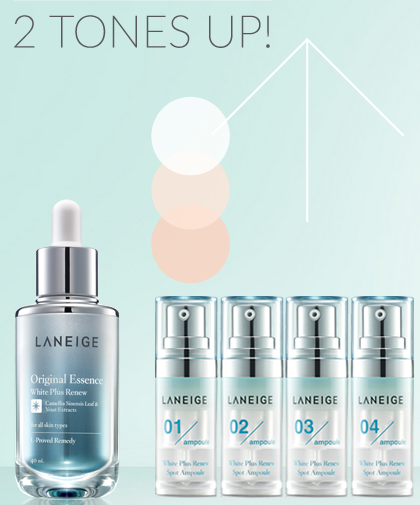 LANEIGE White Plus Renew Original Essence and Original Cream sampling kit redemption valid until 30th April 2015. Strictly 1 sampling kit for one individual and while stocks last.